The Importation Ban on African Rodents of 2001 drastically reduced the availability of new bloodlines and fresh breeding stock to many breeders. 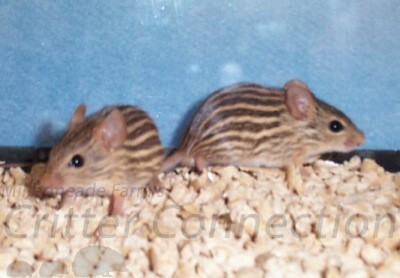 We sold our duprasis and zebra mice colonies to the Bronx Zoo in 2005. Unfortunately we do not know any current duprasis or zebra mice breeders. I use glass aquariums to house my zebra mice. A tight fitting lid is absolutely necessary since zebra mice can jump straight up to the top. They can also squeeze through very small spaces so thoroughly check out their cage before you put them into their new home. I don’t think there is an easy way to catch an escaped zebra mouse. The only way know of is to put their favorite food in the bottom of a 5 gallon bucket. Put the bucket next to something they can climb on or make a ramp up to the bucket with books. Hopefully they will jump down in the bucket to get their food and then not be able to get out. Accessories can include a wheel, clay flowerpots, toilet paper tubes, and other objects to hide in and they will hide! I use reptile bark, aspen shavings or some other wood product as bedding. I seem to have the best results using a variety of different types of food. The main part of the diet is a hamster type seed mix. To that I add small amounts of dried fruit and nuts, cat food, fresh fruits and vegetables, rodent block, monkey biscuits, and more. I like to give them a variety and they eat a little bit of everything. Fresh fruits and vegetables are also very important because some zebra mice get their moisture from the fruits and veggies instead of drinking water. They especially love different types of lettuce and spinach. I have tried several types of watering devices including glass sipper tubes and 2oz bird bottles with a metal tip. I prefer to use a small bird water bottle. I have had much better luck with zebra mice using bottled water rather than tap water. Keep your zebra mice out of drafts. A comfortable temperature is 70° F to 80° F. I give them pieces of tissue or shredded paper that they can use to make a nest. When you are trying to catch the zebra mice, be careful not to grab their tails because the skin of the tail will slip off, and you will be holding only the skin in your hand. I use slow deliberate movements when working with the zebra mice. I gently pick them up by the base of the tail and I quickly let go if they start to jump or twist.